Glenn also told BBC sports editor Dan Roan earlier on Wednesday that the new manager would need to "build resilience" in players so they are able to deal with criticism on social media and the pressures of an "intensely passionate" English media. Allardyce, pictured in the Sunderland dug-out against Hartlepool on Wednesday, enjoyed his best Premier League finish of sixth, with Bolton in 2004-05Bournemouth manager Eddie Howe and USA coach Jurgen Klinsmann had also been linked with the job.Allardyce has been chosen by a three-man FA panel of chief executive Martin Glen, technical director Dan Ashworth and vice-chairman David Gill, who said they were seeking a strong-minded, tactically savvy manager who could build a clear team identity.Glenn also told BBC sports editor Dan Roan earlier on Wednesday that the new manager would need to "build resilience" in players so they are able to deal with criticism on social media and the pressures of an "intensely passionate" English media. "The British press, like it or not, are probably the most intensely passionate about the game in the world and that has a spill-over effect," he said. "The consequence of which is people probably play not to make a mistake, as opposed to play to win. "So the new manager's got to be someone who can inspire people to get the best out of themselves, build resilience and unashamedly adopt the kind of psychological techniques that other sports and other football teams have done. "Sunderland will now be looking for a ninth permanent manager in less than eight years. Former Manchester United and Everton boss David Moyes and current Burnley manager Sean Dyche are reported to be among the favourites.Key facts & figuresAllardyce has never won a major trophy as a managerHe has a 33.6% Premier League career win percentage Sunderland's average possession last season was 39.94%21% of their passes were 'long', compared with 14.4% at Eddie Howe's BournemouthSunderland were seven points adrift of safety at the start of January - but lost just one of final 11 games to escape relegationAllardyce on management"I don't think there is any coach more sophisticated than me any more" - as West Ham manager, February 2015"I would be more suited to Inter Milan or Real Madrid... I would win the double or the league every time" - as Blackburn boss in September 2010"Maybe my external look isn't to everybody's liking. It was the right time and the right job for me but not from the FA's point of view" - in 2009, on missing out on the England job three years earlierReactionFormer Norwich, Blackburn, Chelsea and Celtic striker Chris Sutton on BBC Radio 5 live: "I'm delighted because I've been fed up with fantasy football - you've got to be a realist. Football is about winning. If you win by being direct or by playing a possession game it doesn't matter. "Sam has never been given an opportunity at a top, top club to win a title but has done a terrific job wherever he has been. He will get the best out of the tools at his disposal - that's the most important thing. "Ex-Blackpool and England player Jimmy Armfield: "I signed him as a player when I was manager of Bolton. He was a fighter and he's still prepared to scrap. "I think he will try to instil some what I call 'club confidence'. He will get a team spirit, get the dressing room right. "Former Leicester striker and BBC pundit Steve Claridge: "I don't think the bar is particularly high. It's a sensible appointment. People will have question marks about things but he just has to get them set up properly and give the players a chance. "Leeds United goalkeeper Rob Green, who played under Allardyce at West Ham, told BBC Radio 5 live: "He's a cute manager and will be able to adapt. He's always said, 'I can manage England and I will adapt to that'." AnalysisBBC Radio 5 live football commentator John Murray:"It is a realistic appointment based on England's performance at tournaments. Constant disappointment, getting so far and no further. 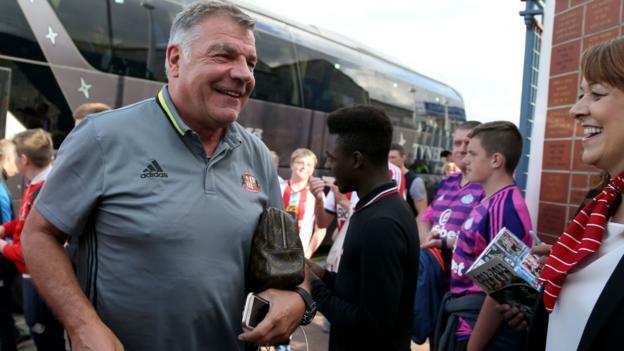 "Time has been of the essence because of Sunderland's position, because of England's position as well - they play matches right at the start of September. "Martin Glenn, Dan Ashworth and David Gill have proceeded just about as quickly as it was possible to do and I feel this is a realistic appointment for where England are. "I think Martin Glenn, in the aftermath of Roy Hodgson stepping down, gave a clear idea and indication that when it came to the salary for the new manager, it would be heavily performance-related. I would expect that to be the case. "England's next fixture is their opening World Cup 2018 qualifier against Slovakia on Sunday, 4 September. If Allardyce is in charge, who would be in his starting line-up?Subscribe to the BBC Sport newsletter to get our pick of news, features and video sent to your inbox.